Fried turkey? In April? Yes, that’s what I thought too. But after talking Brandan out of many other (more expensive and difficult to source) ideas (Rattlesnake? Eel? Yes, there is no doubt, the boy has an imagination. If it is an animal, then he’s wondered if it could be food. ), this one was doable. In my mind, there’s a seasonality to frying a turkey (and if we’re being honest here…and why wouldn’t we be…I prefer a well-roasted turkey to a fried one). That’s generally the consensus in this country, as evidenced by the lack of abundance of turkeys in the stores. With a little luck and scrounging around, I managed to find one that was in the 18-pound range. Larger than I had hoped for, but it would do. So we got started. While many recipes for fried turkey call for brining, injecting all sorts of concoctions, and/or rubbing the bird down with a spice mixture (and trust me, they sell a lot of preservative-laden, most-likely-gluten-filled products out there to help accomplish these tasks), we opted for simple. I brought out a jar of my favorite BBQ spice rub mix (minus the sugar), and we rubbed down the turkey with the seasoning. Other than that, no further preparation was needed. Once the oil was hot, we dropped the turkey, and waited. And checked the temperature of the oil, waiting for it to come up. And waited. It wasn’t coming up. It was windy that day (we’ve had day after day this spring of very high winds), and so I was afraid that the wind was keeping the flame low. We tried to block the wind to no avail. The oil was still reading around 200 degrees F. Finally, my husband suggests to check the temperature of the turkey. (It wasn’t nearly time to start checking yet, but I agreed that we should try.) That’s when we discovered the oil thermometer was inadvertently stuck, just slightly, into the bird, thus preventing an accurate oil reading. Whoops. We remedied the situation, discovered that the oil registered an accurate 350 degrees F (that’s more like it!). Thankfully, the oil wasn’t higher than 350 degrees, as we could have entered into dangerous territory! Before we knew it, the turkey was ready to remove and allow to rest. For Brandan, the resting was the hardest part. The aroma was incredible, and the skin was so crackly. The bird looked good. However, we managed to restrain ourselves (minus one or two small pieces of the edges of the skin) until it was carving time. That’s when the boys in our house are suddenly immensely interested in what’s going on in the kitchen, and start hovering around the carver (that’s me! ), waiting to swipe a morsel from the plate. I’ve learned to work swiftly. How was our turkey? 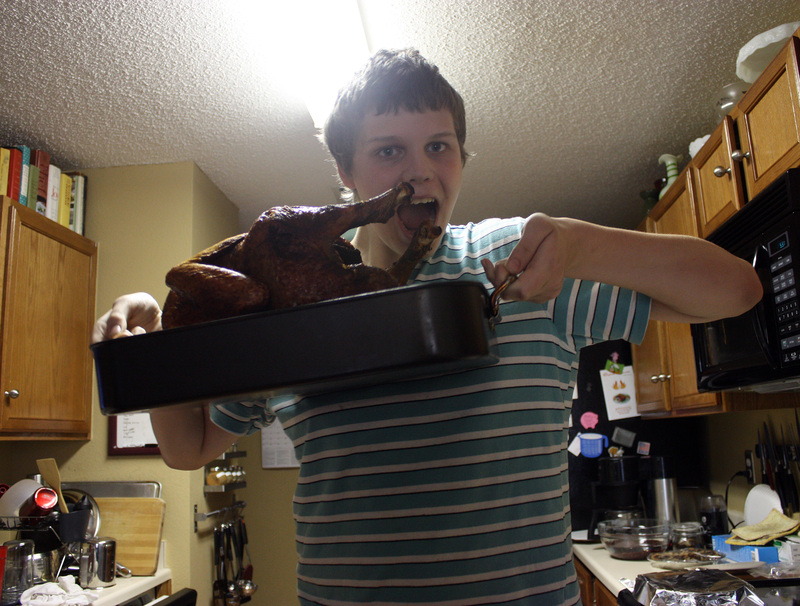 Well, in spite of my previous opinions about turkeys in April, it was quite good. The breast meat was unbelievably moist and flavorful – the best part of the bird, we agreed. Brandan enjoyed a wing and a leg. There wasn’t much conversation from him at the table – he was too immersed in his meal. Everyone eating that evening was more than pleased. Some of the dark meat was a bit dry, as the turkey was in the oil legs-down, so they most likely got more heat exposure than the breast. In spite of that, it was still quite tasty. 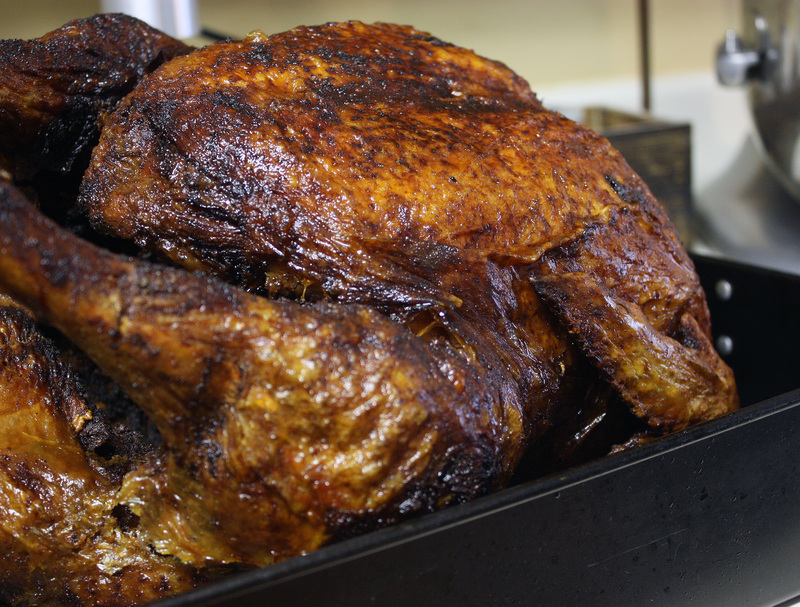 While I do hold true to my opinion about roast turkey over fried, I will have to say – this was a good bird! 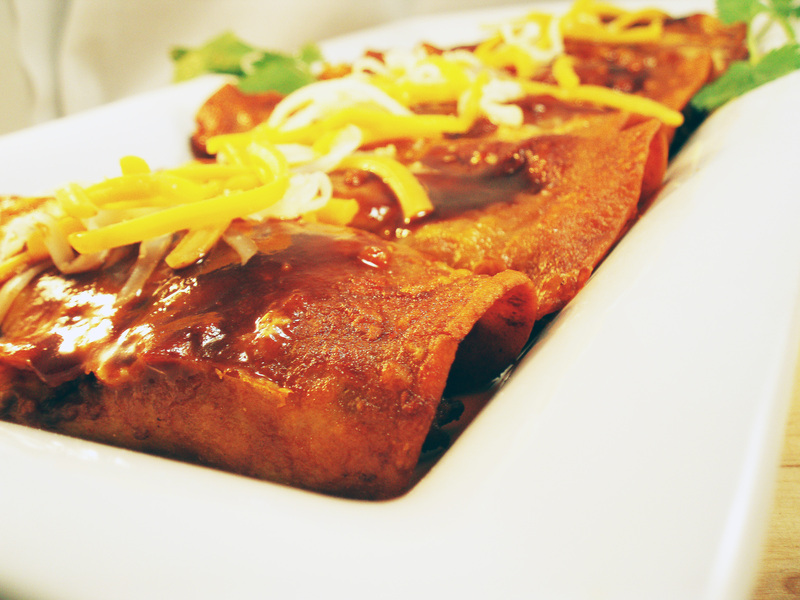 And yes, we made enchiladas the next day with leftovers, so it was double the pleasure. Lesson learned? Next time, I will be sure to not stick the oil thermometer into whatever I am frying! Before starting, place your still-wrapped turkey inside your fryer pot. Fill with enough water to just cover the turkey. Remove the turkey, and look at how much water remains in the pot. This is how much oil you will need to use. (You don’t want to measure too much and risk a hot oil overflow disaster!) Pour out water and dry the pot well. Pat the turkey dry and rub seasoning all over bird, including inside the cavity. If you have a wire holder with which to lower the turkey in the oil, place the turkey on it now. Pour required amount of oil into your pot (I used a little less than 3 gallons). (Do this outside, away from an overhead cover. You might opt to place a large board or cardboard underneath to catch splatters.) Place the pot on the burner and light the burner. Heat the oil to 350 degrees. Make sure you don’t leave the oil unattended. Once oil is at temperature, carefully lower your turkey into the oil. Bring the oil back up to temperature (325 – 350 degrees is optimal). Your turkey should take about 3 minutes per pound to cook (my turkey took roughly an hour). Start checking the turkey’s temperature about 2/3 of the way through by inserting an instant-read thermometer deep into the breast. Once it reads 170 degrees, remove the turkey and set it in a roasting pan to rest, covered with foil. Rest for about 30 minutes and then carve. Lately, we have been focusing on lighter, healthier fare. Why? Well, why not? For one, the weather (The forecasted high temperature today is 106 degrees!) begs us to leave the oven off and keep the kitchen cool. The sooner I can turn off the stove (if I turn it on at all) and get dinner on the table, the less the air conditioning has to work. In addition, we would like to not have to work so hard at keeping our waistlines from expanding. Salads are great, but we can not live by salad alone. This is where burgers come in. But in keeping with the lighter, healthier fare, (and because ground turkey was on sale) I opted for turkey burgers. Now, I have made many a burger in my lifetime. Turkey burgers, however? I’m not as experienced. I was worried that my burger would end up dry and bland. I knew I wanted to throw in a lot of herbs to boost the flavor without added fat (and because the garden is overflowing right now with herbs!). As for the remedy to a dry patty, I turned to Amy at Simply Sugar and Gluten Free. Amy participated in a burger contest last year (she was a finalist! ), so I knew she was a great source of information. I found a turkey burger recipe on her site, and found the secret – mushrooms. I had mushrooms in the fridge, and so I took a cue from her and threw them in the food processor. In addition, I remembered that I’ve used almond flour as a bread crumb replacement in meatballs and meatloaf in the past, and it always boosted the moisture when compared to other “breadcrumbs”. 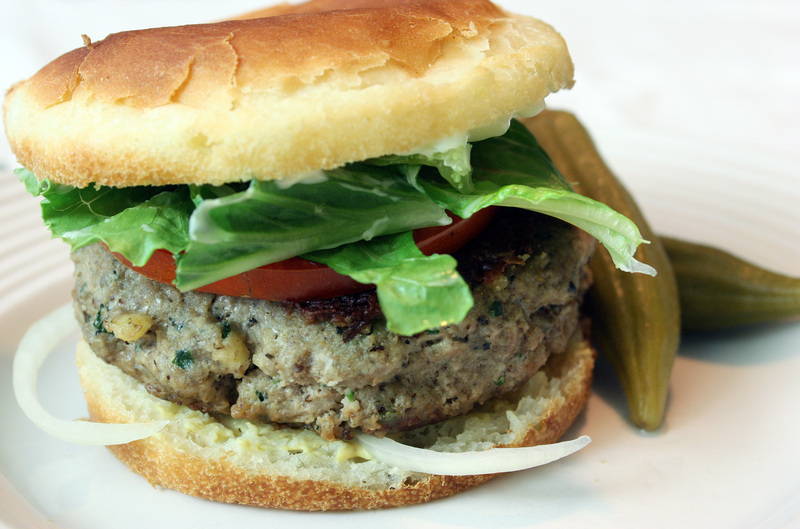 I played with the flavors a bit, and hoped my herb-y turkey burgers would come out well. The result? These burgers are on the regular meal rotation! The husband raved about them – and when you can get my husband to enjoy turkey burgers, and not simply rate them as “okay, for turkey burgers” (and secretly wish they were beef), then it’s a recipe worth repeating. They were moist, with just the right amount of fresh herbs, and plenty of flavor from the cumin and dijon mustard. I even splurged and enjoyed mine on a Kinnikinnick bun. (Yes, Tasty Eats At Home sometimes buys pre-made buns. See reasons to keep kitchen cool above.) It was mighty tasty. In a large bowl, gently mix the mushrooms, ground turkey, and the rest of the ingredients together. (I do this with my hands.) Heat a skillet to medium heat and add a bit of the olive oil. Pinch a small, marble-sized ball of the burger mixture and place it in the skillet. Brown on each side until cooked through, and taste. Adjust seasonings to the rest of the mixture as needed. (This is a great way to ensure you don’t make a bunch of bland patties – I do this for meatballs and meatloaf as well.) Form into 4 patties. Add additional oil to the skillet. (Alternatively, you can use a grill pan or even your grill outdoors. If grilling outdoors, you might opt for a grilling basket for burgers, as these burgers are more fragile than beef burgers and more apt to fall apart. You might also try freezing them for 30 minutes before grilling to keep them together.) Place the skillet and cook for about 5 minutes per side, until browned. Check the internal temperature of the burgers, and cook until the center reaches 165 degrees F. (You might choose to put a lid over the skillet and turn the temperature down to allow the burgers to cook through.) Remove and allow to rest for 5 minutes. Place on a gluten-free hamburger bun (or go bunless!) and top with desired condiments and toppings. I opted for dijon mustard, soy-free mayonnaise, lettuce, onion, and tomato. If you opted to go bunless, then this patty would taste delicious on top of field greens and tomatoes, with a bit of balsamic vinaigrette or honey mustard dressing. If only I could find an excuse to put chipotle in everything. Okay, okay, not really, but I do love the stuff, in case you haven’t noticed. (See here, here, and here, just as a small sample) In fact, just about anytime I’m looking for an in-your-face, bold taste, chipotle does the trick. 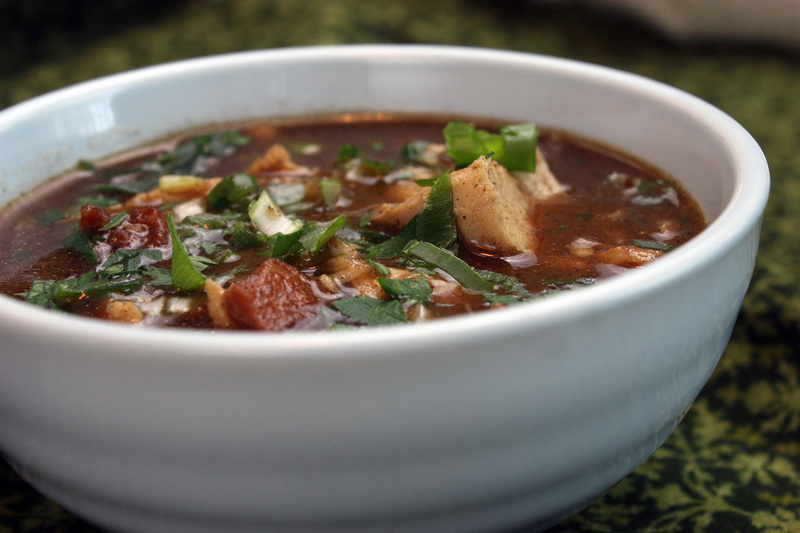 Smoky and spicy, it adds an unbelievable amount of dimension to a dish. Take chicken, for example. Chicken is nearly a blank canvas, something one flavor with any combination of herbs and spices, and create a seemingly endless number of dishes. Soy, ginger, and garlic? Asian chicken. Oregano, basil, tomato, garlic? Italian chicken. But what about orange juice, chipotle, sage, thyme, and rosemary? You get chipotle orange-herb chicken. This recipe was inspired by a chipotle orange chicken that Elana shared at Elana’s Pantry. (Elana has a wonderful array of gluten-free recipes.) I increased the amount of chipotle a bit (we like spicy food at the Tasty Eats At Home residence), and I subbed the dried herbes de provence for fresh herbs, but largely left the original recipe in tact. If you have small kids, you might choose to lower the chipotle, but this should be a great family-pleaser, one that is easy on you, too! I served this dish with a generous helping of steamed asparagus with lemon zest (recipe to come soon, stay tuned!). Pat chicken dry with paper towels. Place chicken in a 9X13 inch baking dish. In a small bowl, mix garlic, herbs, agave, salt, chipotle, and orange juice. Pour over chicken, turning chicken over to coat. Cover dish and place in refrigerator for minimum of an hour, up to overnight. Remove from refrigerator, and bake at 350 degrees for 40 minutes, or until chicken is cooked through.